I started to wait for the B49 bus Wednesday, 10/17, at 12:40 PM on Oriental Blvd and Falmouth Street. The first bus that stopped was at 1:10 PM, thirty minutes later. There were three other passengers waiting. Shortly before the bus stopped, I asked one of the other passengers how long she had been waiting. She said, since 11:40 AM and that she had been waiting for the B49 for an hour and a half. She also told me that six buses passed by without stopping. I got her e-mail address. In the first video a crowded B1 passes as one of the passengers tried to flag it down. 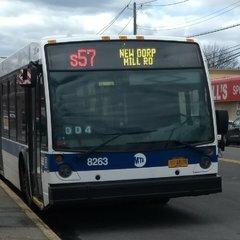 In the second video a bus marked B49 to Empire Blvd passes, immediately followed by an empty bus marked "Next Bus Please". So the question is why after five buses bypass the stop with passengers waiting presumably because they are all overcrowded, why would a dispatcher order the sixth empty bus to also skip all stops with a sign marked "Next Bus Please?" How are these dispatchers trained and what are they accomplishing? I have been complaining to NYCT Road Operations now for at least seven years about this problem in Manhattan and Brighton Beaches and each time has been assured the problem will be addressed. Each time it gets better for a while, but the problem always reappears. This is what happens when you have only enough staff to put out fires and not permanently address reliability problems. I wrote about this issue last March in the Queens Chronicle questioning the training of bus drivers and dispatchers. Andy Byford promised to look into buses not stopping in a follow-up article by the newspaper, but I never heard anything further. Extra long waits such as this is the major reason bus ridership is declining. They really need to have extra service in Manhattan Beach. B1 and B49 Buses are always packed when leaving Kingsborough. I still remember the dai my friend and I got on the bus through the back door, because the bus was stating to get crowded from the front. I barely got on. I'm not sure who your contact is with road ops, but there have been some changes. You should PM me for details. How are these dispatchers trained and what are they accomplishing? I remember in the summer, dispatchers were sent out to stops in Manhattan to make sure the express buses were running on time. Whatever they are doing is obviously ineffective. Anyway, there is a full-time dispatcher at Kingsborough College when school is open and that is under a half mi,e from where I was standing. So I really doubt it that in the his case decisions were being made at the depot. When I stood at the first stop, many times, I witnessed instances where the dispatchers decisions actually made things worse. In fact the day before I stood there for 30 minutes and the dispatcher let one of the shuttle buses leave the terminal with only six passengers, while everyone was getting on and crowding the bus going the full length of the route. The purpose of the shuttle bus is to take students to the subway a mile away. He should have waited about four more minutes until he was full. Sending him out with six passengers is a wasted trip since no more than four more will board that trip. There are dispatchers out in the field. I see them everyday and I think they recognize me. There's one guy I see almost every morning now either on Madison or on 5th when I am checking out the bus lanes and I'm sure he has an idea of who I am given my speech before the Board. Anywho there was an accident the other day that had him running over from 5th to Madison. I agree though. Some of them seem worthless. They are spending more time shooting the breeze than anything else. And some of them work with the bus drivers just to give them unneeded overtime, a situation I once witnessed myself. I even spoke to the dispatcher to make sure I wasn't misinterpreting anything. I even had it on video and sent it to Tom Prendergast. Never heard anything back. lol I believe some things have changed, but not everything. They are trying to be more customer focused, but they don’t seem to be able to follow through on service. The B49 is has has been a MAJOR problem for white some time now. Once upon a time it was my home line and it definitely needs some improvement. The problem is why would a dispatcher send a bus not in service after people have been waiting over half an hour because buses are too overcrowded to stop. As Checkmate said, the bus could have at least made a short trip to the subway before running off. The passengers need to come before cutting overtime. That all depends on exactly what's going on. Dispatchers place buses depending on many factors, and unless you know the situation you can't always know exactly what is going on. Next Blus Please is used when a bus needs to be placed. If there is a major gap in service the bus could have been requested somewhere else and at the end of the day, someone is going to have to wait. It comes down to where can the bus be placed to that when normal service resumes it is in a proper location to be used where needed. Lets say a bus is already severely behind schedule, and its interlined with another bus. If dispatch does have it go Next Bus Please, the next transfer line may be messed up for the rest of the day. Dispatch has to make due with what they have at any given time. Sometimes they cant afford the time to have a bus pick passengers up on the way to another location. That defeats the whole purpose of the bus being placed. It's 2018. they don't cut overtime like what you may think or what they used to do. They frequently ask for overtime and there is an overtime pool for drivers on their days off. They are in the system for overtime trips. There is always a need for operators now. I haven't heard of them trying to cut overtime in a very long time. So that can't be counted in as a factor now. They are always asking ops to stay or cover other runs. Sometimes operators that are scheduled to pull in on break then get another bus after don't have to if there are enough buses for service for example. The op than then keep the bus while on break which insures there should be an on-time pull out. Every situation is different. I understand what @checkmatechamp13 is saying and I agree that a few deadhead help trips would be good. But if that bus has another destination and the time is coming do, dispatch is forced to make a tough decision and figure out which passengers will have to wait longer. In this case the empty bus marked NBP could have been and was likely going to an entirely different route. Many times when a bus paases saying Next Bus Please, it's not even a run for the route or routes on the street you are near. I as well as my MTA employee friends who own buses have had people run up to our buses start cursing and they aren't even MTA vehicles, even if they look similar just because they are RTS buses. My friend who works in CH, and lives across the street from UP drove my bus along the B6 and everyone was looking like they wanted to come up to it. It clearly isn't in MTA colors, but they think it's some new scheme and the sign says "Out Of Service." I will still have people run up to my bus and say "I'm only going up the street." This happens all day to MTA vehicles, but they could be going to or from anywhere and may actually be on a schedule. For this particular incident, I'm going to look up the runs in that area based on the timestamp of your video, and I can get a better picture of what happened that day. Please standby. So I looked into it........... At that time, there were buses going to and from locations with operators coming off runs and going onto others. It also appears that I may have run into a perfect example of a MAJOR problem that is causing a decline in ridership. If so this will be another example I can add to my long list of bus routes that this issue has plagued for years. The B6 for example suffers severely from this all day and night after buses pull off from New Lots ave. About 25% of the daily capacity has room for "First Stops" passengers. That particular bus (7338) was on a schedule elsewhere for the B49 so it was not an available bus. If you knew the numbers of the others I could look them up. Looks like they were deadheads on a schedule though. Also remember that Flatbush (B49) as well as Ulmer(B1) operate over there and the dispatcher can only request a bus if it's available. I didn't look up the B1 as it was not the topic of discussion, so I'm not sure if there were delays that caused both lines to be behind schedule or not. I can definitely see where you had a wait of about 30 minutes. ****However the lady being there since 11:40 doesn't make sense unless its one common, yet unaddressed issue. I looked a bit deeper, and recalled a few examples that I have documented during some surveys. If this was truly the case, which all evidence points to being true on all accounts, then yes there is a major dispatch problem which I am very familiar with. However it is a breakdown internally, and not necessarily dispatch's fault. Many times (most everyday) there are back to back runs that are always full to capacity from the start of a terminal. This means the first 3-5 bus stops may not see bus service for long periods up to hours at a time. The next major stop will likely be the first point a crush-loaded bus can take on additional passengers. I'm going to dig a bit deeper because I think this is the issue here. If so, rest assured it has been brought up in my Fast Forward Plus Plan, and addressed the need of extra buses for double-runs, true leader/follower runs, and emergency put-in's. The B49 has multiple issues that need to be addressed, and will be. Again, as I said, I will follow up when I review this further. I am however 95% sure the above "First Bus Stops problem" is the likely culprit. Not sure what you are saying. Next Bus Please was supposed to be turned on temporarily when buses were too crowded and late to make up time just to discharge passengers. At all other times, "Not in Service" is the appropriate signage. Road Operations told me a year ago that operators were instructed not to use the Next Bus Please sign anymore. Why would a bus be sent elsewhere to hover a gap in service when the gap in service was where the bus was? I think waiting up to 90 minutes qualifies as a big gap in service and can't imagine a larger gap elsewhere on the route. Thanks for looking into this. I never got a response from anyone from Road Operations who I also copied this on. Why doesn't it make sense that the lady was waiting since 11:40? You wouldn't know if that was true or not because she did say three other buses passed her without stopping but didn't say they were all B49s. But in 90 minutes, assuming 12 minute headways, at least 7 B49s should have passed by. Yes, that is precisely the problem that all stops prior to the subway on both lines may not see service for an hour at a time which is what I have been complaining about for seven years and is totally unacceptable. I was once told by Road Operations that bus drivers were instructed by dispatchers at McKenzie to skip all stops to the subway and only stop at those stood once every 30 minutes. They agreed that that was wrong and they would change that. Then there was the argument I had last year with a bus driver trainer that I wrote about in the Queens Chronicle (which I linked) who instructed the driver not to stop because passengers were near the white line rather than instruct the passengers to move to the rear where there was plenty of room. If the drivers are not properly trained because the trainers are not properly trained, what can you expect? I got the lady's email address that I will PM you if you want to ask her about the 90 minutes she claims to have waited. Sometimes bus operators use common sense but they have to break the rules to do that. Last year, one bus operator knew the back of the bus was empty and no buses were stopping, so he stopped and directed me to enter through the rear door. That saved me 30 minutes. Maybe that should become official policy in situations such as this. Also, sometimes I see B1 operators intentionally opening the rear door so passengers can enter through both doors at Coney Island Avenue and the bus can leave quicker. Since everyone is transferring, no revenue is lost and it makes perfect sense, but they are breaking the rules also. Bus operators should not have to break rules to do the correct thing. This all needs looking into. But since management doesn't ride the buses, they are not aware of what really goes on. If the is now moving towards relying on overtime as a regular tool to cover runs, that can be just as bad as when they try to cut back on overtime. It is much more appealing to the to rely on overtime rather than hiring more B/O's, since it is a whole lot cheaper to pay benefits for only 1 employee and offer him overtime than pay salary plus benefits to two employees. But B/Os can only take on so much overtime, and the fact that there seems to consistently be more overtime available than B/Os to cover it all ultimately means that runs will not go filled if no one can take the overtime. lol@covering runs. We both know how well they’re doing in that department. I’d argue that they’re trying to reduce overtime to reduce their overhead costs. What I am saying is there were buses over there which were going to other routes, and have have nothing to do with those B1 or B49 runs in question, so I'm not sure what you are saying. Buses have schedules even when out of service. If the B/O has to be somewhere it isn't a matter of "why go somewhere else when service is needed here." Remember I said the B49 has interlined runs, and the major issue is not having capacity along the first stops. Dispatch can't just make a driver go somewhere just because the area needs service. Not only that, but im certain they didn't even know what was going on in that area, so you can't expect any extra buses to come cover service. Since there was not any "visual" service problems or serious delays, no one would even know any of you were standing there if you had not made this post or contacted the MTA. The was no gap in service, the buses were just over capacity. It doesn't work like that. You can't just pull buses from somewhere unless they are already free. That bus was going to start a run at the other end of the line. You don't mess up service in one area just because of service issues in another. Many times when a bus is deadheading, you don't know what route it is or where the bus is headed or coming from. It could be a depot transfer, headed for maintenance, a test drive, or someone can simply be deadheaded on a street where there is service issues that they have nothing to do with. There are so many factors at play and things have changed quite a lot since you were last in Ops. There is a new team in there and they do things in a way no one quite understands these days. And yes operators are instructed to use "Not In Service" but they don't always. Most of my friends play with different signs, or use NYCT Bus. Many use Next Bus Please as well. It's been going on for decades and likely still will at times. For the most part, 90% of the time ops are using Not In Service these days. Another thing is the BusTime GPS, and destination signs are automatically updated by the farebox. If a driver manually changes the sign to Next Bus Please he has to remember to change it back or the bus will remain offline. They do sometimes forget. Same with Next Bus Please. If a driver was ordered NBP to the end of the line and forgets to change to NIS, he may be deadheaded and not paying attention to the sign. MTA isn't relying on anything. There has always been the extra board which is where operators don't have a schedule and are deployed wherever needed. The report to work at a specific time and standby until needed. The overtime pool is mostly for ops on their Regular Days Off. This is a list that they are put on if extra help is needed. You also have to remember that when there are shuttles, more drivers are needed for those as well. Let's say for example there are 4 drivers on the extra board at ENY today. I driver calls in sick, 2 buses break down, and one gets into an accident. Those 4 extra drivers are now taken and depot command is going to pull the list and see whos on at home extra duty. Now lets say another bus breaks down, or there is an incident before the next op get to the depot. Now there is a missing run. Some days all 4 ops may stay in the depot watching TV and sweeping, or shifting buses in the lot for 8 hours because no one called in, and everyone was able to make service. MTA is constantly hiring. It's not about that. You have operators retiring, resigning, getting fired, suspended, and others getting promoted. There is always a need for operators and a class just graduated last week. More will be coming in in January. There is a 4 year average waiting list. Thousands of people are waiting to get in as I type this. Example, one of my really good friends resigned from Bus Company and will be starting in OA or Brooklyn TA come January. ...Another thing is the BusTime GPS, and destination signs are automatically updated by the farebox. If a driver manually changes the sign to Next Bus Please he has to remember to change it back or the bus will remain offline. They do sometimes forget. Same with Next Bus Please. If a driver was ordered NBP to the end of the line and forgets to change to NIS, he may be deadheaded and not paying attention to the sign. Knowing about the overcrowding issues and buses frequently not stopping at the beginning of the line for SEVEN YEARS NOW, there is no reason to schedule any bus arriving at KCC to go to another route afterwards. If a bus is scheduled to run off to the depot and there is an issue at the beginning of the line, the dispatcher should place that bus in service even if it means a few minutes of overtime. Also, the dispatchers are not blind if they are doing their job correctly. They knew there was no B1 and B49 for at least 20 minutes, and also knew other buses were leaving the first stop too overcrowded to pick up for the first mile. So to say they wouldn't know any of you were standing there is absurd. The lady waited 90 minutes for a B49. Let's say that four of the six buses that didn't stop were all B49s and they were evenly spaced which probably was not the case, that would mean that that buses were arriving every 20 minutes when scheduled for no greater than every 12 minutes. So how can you say there were no serious delays? If fewer than four buses were B49s and some were B1s or not in service, then the delays were even greater. Then you say "that bus was going to start a run at the other end of the line." What sense does it make to run not in service for one entire one way trip? If the MTA is using the logic that the bus can make the trip 15 minutes quicker and therefore, it costs them less which is what I suspect, then they have totally forgot why they are even in the bus business. It is to OPERATE SERVICE TO PICK UP PASSENGERS, not to run buses empty. This statement of yours is also troublesome: "There is a new team in there and they do things in a way no one quite understands these days." That is precisely the problem. There needs to be transparency so it is obvious what they are doing. The dispatcher said, now let's get us another bus. We did that about three times (and each bus was "dogging it" until all the passengers were on buses by about 9PM. If not for his actions they would have remained there until 11 PM. (That was the same night that 300 people had to sleep in Riis Park, because the last B9 and B49 left Riis Park at 9 PM and people could not get on the buses because they were too crowded.) We saved them two hours of waiting. The point is you can give me all the excuses you want why something cannot be done but all it takes is a few people who care to get something done. 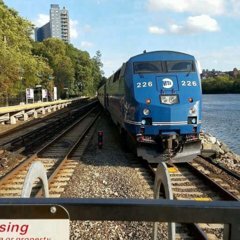 The MTA needs to start caring about its passengers and that needs to be the top priority instead of making the budget their top priority. And sometimes improvement don't even take money. When I was director of Planning, I also noticed that on the B49 just when people were leaving the beach, every third bus was scheduled to go out of service at Avenue U which most of the passengers could not use since they were going further so I asked Schedules to see if they could have those buses go up to Farragut Road instead and run off from there instead, about the same distance as from Avenue U, to make those partial trips usable. (The buses used Farragut then instead of Foster.) I was told, they got 12 extra trips at a lower cost and the buses became much less crowded. My boss couldn't care less when I told him what I accomplished. I am sure I could have accomplished much more if they had let me keep my job. While you may care and want to do a good job, and I am sure there are many others like you at the MTA, there needs to be major changes in upper management with priorities shifted. Tom Prendergast recognized the need to change the MTA culture and even issued a memo that to that effect, but it was largely ignored. When are the B/O's supposed to use "NYCT/MTA Bus" signs other than deheading? So what was happening after those big budget cuts in 2010 (or 2011?). I remeber complaining to the MTA about missing runs and their response was "we are not replacing drivers who call out sick, so that is why buses are missing". Did they not have the extra board then? So what was happening after those big budget cuts in 2010 (or 2011?). I remeber complaining to the MTA about missing runs and their response was "we are not replacing drivers who call out sick, so that is why buses are missing". Did they not have the extra ﻿board then? Sadly, I strongly believe that this practice is continuing, which is why so many scheduled trips are going missing, and it's worsening and spilling over into rush hour. It's like the kid that goes and sneaks and puts his hand into the cookie jar and steals cookies. The getting becomes too good to be true, so they go back and steal more, and right now they're stealing our service to balance their budget. .....Buses have schedules even when out of service. If the B/O has to be somewhere it isn't a matter of "why go somewhere else when service is needed here. ....You can't just pull buses from somewhere unless they are already free. That bus was going to start a run at the other end of the line. You don't mess up service in one area just because of service issues in another. Many times when a bus is deadheading, you don't know what route it is or where the bus is headed or coming from. It could be a depot transfer, headed for maintenance, a test drive, or someone can simply be deadheaded on a street where there is service issues that they have nothing to do with. There are so many factors at play and things have changed quite a lot since you were last in Ops. There is a new team in there and they do things in a way no one quite understands these days.